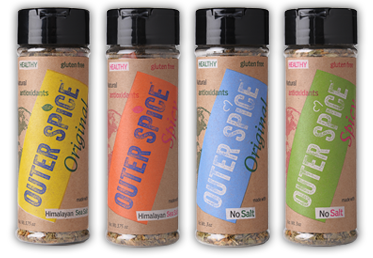 Flavor your Food the Healthy Way with Outer Spice! Looking for a healthy way to flavor up bland healthy foods? How about some Outer Spice? Outer Spice is a new company that created four highly versatile new low salt and no salt seasoning blends, made from the finest quality herbs and spices, that are hand sourced from around the world. The blends are healthy, all natural, gluten-free, rich in anti-oxidants and contain no MSG. Each spice is finely ground by a family-owned artisanal spice company in Austin, and packaged the same day to ensure freshness and quality. The well-balanced spice solutions transform and improve the taste of every dish, whether you’re a chef, foodie or don’t enjoy cooking. Outer Spice makes cooking, fun, easy, healthy and delicious. I received samples of Outer Spice to review. I was sent Outer Spice ORIGINAL- NO SALT, and Outer Spice SPICY. Outer Spice SPICY is designed to give any dish a little bit of kick without being too hot or eclipsing foods natural flavors. It is high in flavor and low in Sodium. Enjoy the same great taste and versatility found in our original Outer Spice with just a little extra ZING! Great for BBQ lovers. SPICY is so delicious on salmon! We barbecued salmon last week, and it tasted heavenly! Outer Spice ORIGINAL- NO SALT has a unique combination of freshly ground herbs and spices to boost the flavor of any dish without the sodium. Use as –is, or add to it and make it your own. Sprinkle on eggs, salads, pastas and veggies. Rub on fish, chicken, beef and pork. Create marinades, dressings and dips. This is a great addition to diets requiring less sodium and really helps to bring foods to life with out the use of salt. I am currently on an all-protein diet. Well, mostly. Anyway, I eat a lot of plain yucky fat-free cottage cheese. (It works, I have lost eleven pounds!) 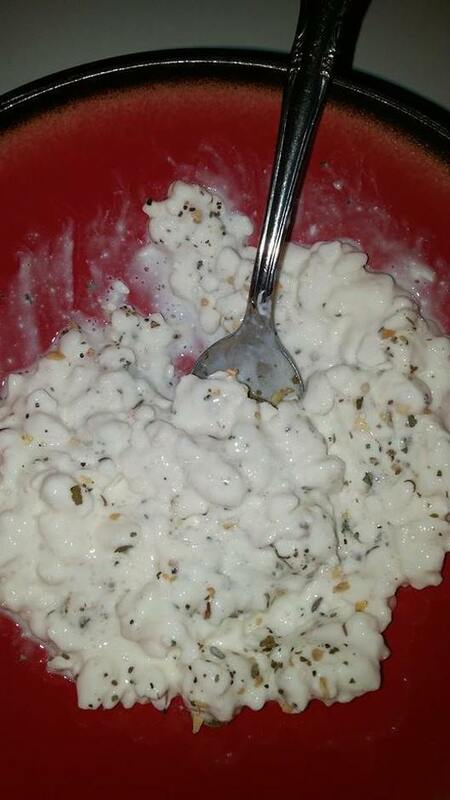 I decided to spice up my bland cottage cheese with Outer Spice ORIGINAL- NO SALT. It tasted amazing! How? It's easy! Just enter to win using the GiveawayTools form below. Good luck! All August Outer Spice is offering free shipping with no minimum purchase! 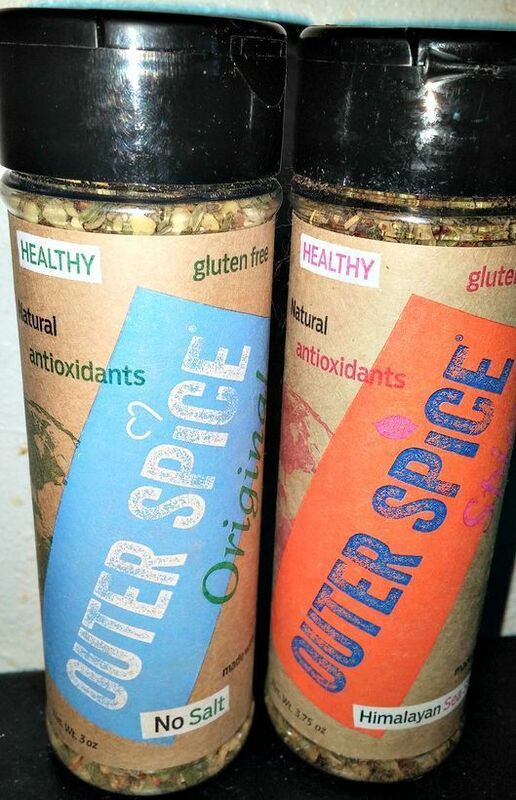 Consumers can purchase all four flavors for $6.99 each at http://outerspiceit.com and pay zero shipping! This looks so delish my thighs need this!!! I use lots of fresh herbs and garlic in my cooking. I use sea salt or garlic to spice up or season my food. I am a big believer in salt and pepper, also in fresh herbs. It depends on what I am cooking.We use a variety of spices! I usually spice up my foods depending on what I make, however I usually just add salt & pepper ! I have a LOT of spices. You name it, I have it most likely. Except for Saffron... LOL or some of the Chinese spices.. I don't have everything.. but I want to. I love to have flavor in every dish and I like to try everything. I season my food with garlic, onions, carrots, celery, salt, and pepper. Almost everything I cook starts with onion and garlic. I also use fresh ground sea salt and pepper, and depending on what I am cooking, I will add adobo (a Spanish spice blend) and cumin or an Italian spice blend. My motto always is, you can always add another clove of garlic! I use salt and pepper and maybe thyme and rosemary. I always use salt and pepper. Then, I have a cabinet full of other spices I use depending on what I'm cooking. I put salt, pepper, and cayenne on pretty much everything I eat. I usually just add some garlic and salt!! I would love to try your spices! I usually spice up my food with season salt and lemon pepper. I use Himalayan pink salt and garlic a lot to spice up my dishes! I don't use too many spics but I do love adding red pepper flakes to my food for a little spice! I use salt, or garlic salt, but this looks way better! I like some hot spice in my spices. I use lots of lemon pepper. I have a whole cabinet of spices, but sometimes it's too overwhelming to decide what to use. My husband is the cook at our house and he is from New Orleans. Bam! Lots of spices! I use pepper, onion and garlic salt. I'm on a high protein diet too (yes it does work) and I would use this seasoning to spice up my chicken breast. I use a lot of schiracha sauce. I'm always experimenting with new seasonings. I like to mostly use salt and pepper and parmesan cheese. I use the appropriate spice for whatever dish I am making. Sometimes more garlic and pepper, not a lot of salt. I marinate a lot of my meats and of course salt and pepper and usually onions or onion powder. I have a variety of spices from Penzey's. I experiment with adding them to different types of food to see what I like best. I use salt and pepepr. I like to add garlic salt to just about everything. I use more cinnamon in fall.